If educators are looking for opportunities to familiarize themselves with the AIR testing platform and item types they can explore the Ohio Computer Based Test Portal. The platform currently contains examples for Science and Social Studies. ODE is in the process of developing materials for the new Math and ELA tests and will have these materials published along with more information on the new state tests in the coming months. The department has prepared two calculator policy documents (one for high school and one for grades 6-8) to assist educators and parents whose students wish to select calculators they can use while taking state tests in mathematics. Calculators are important instructional tools that are allowable - but not required - for students to use while taking state tests. For students taking the computer-based tests, a calculator will be provided in the technology platform for the test. Students may use handheld calculators for either the computer-based or paper-based test formats and schools may permit them to bring their own handheld devices to school for test purposes. In each guidance document, you will find recommendations for calculators as well as prohibited calculator functions and features. Each document also provides information for students with disabilities who have accommodations related to calculator use as part of their individualized education programs or Section 504 plans. How will new tests be developed? 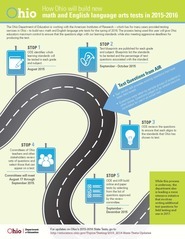 For an overview of the test development process, see this road map illustration. Educators statewide have volunteered to participate on content advisory committees to develop Ohio’s 2015-2016 state tests. Their work will be guided by previous efforts of educators who have devoted countless hours to the development of a new generation of tests. Review of English language arts and mathematics test items for 2015-2016 Ohio’s State Tests started Aug. 18. Over 1,400 Ohio teachers and content specialists applied to serve on the content advisory committees for English language arts and mathematics. About 250 Ohio educators were selected to review and validate items for use in Ohio English language arts and mathematics tests. Every test has a content advisory committee. The purpose is to review and evaluate test questions and related test materials to make sure that each selected question is a valid and appropriate measure of Ohio Learning Standards for that particular subject area and grade level. An All-Call for applications to serve on the Mathematics Standards Setting and Rangefinding committees. Standards Setting will meet only one-time in December 2015. The Rangefinding committee will meet for the first time in late spring 2016. Further information will be coming soon.